Bohol is blessed with a number of marvelous white beaches, which just await to be discovered and enjoyed. Alona Beach is one of the famous beaches on Panglao island. Located at the Southwest of the island, this beach is about one and a half kilometers long, lined with nice resorts, which are great to stay for a some time, a number of well equiped diving establishments and pleasant places to eat out, if you do not want to eat at your resort's restaurant for a change. 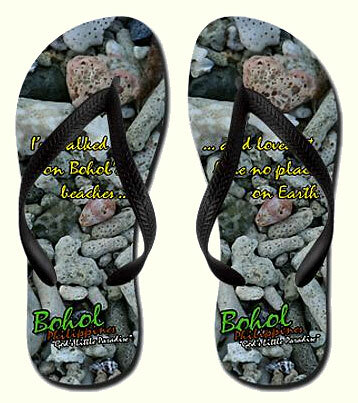 exclusive Bohol flip flops, USD 16.50-18.50. Probably the only drawback of the beach are the large numbers of sea urchins that inhabit the water, starting some twenty or thirty meters out of the coast. You will just have to be careful when wading. Don't forget to bring your snorkeling equipment. When you swim about one hundred meters off the beach, you will reach the edge of the 'house' reef, at between three and five meters deep, and thus can be easily observed even without scuba equipment. If you are into scuba diving, though, don't forget to have a few dives here as well, as it is certainly worth it, not bad at all, even compared with the reefs the boats will bring you to. Dumaluan Beach, also on the south of the island, is about two and half kilometers east of Alona Beach. Here you will find some of the more exclusive beach resorts of Bohol, such as the Bohol Beach Club. Bikini Beach is about eight kilometers from Tagbilaran, and hence a popular location for local pick-nickers. Momo Beach is on the north side of Panglao. This again is a shallow beach. Doljo Beach (pronounced 'Dolho' beach) is on the Northwest of the island, not far from Momo beach, and is also a nice beach, mostly free from sea-grasses. This beach is known for the beautiful sea shells that can be found here. Between Anda and Lapinin Island. Between Lapinin Island and Jeta Fe. Between Jeta Fe and Tagbilaran. Seriously, people saying Panglao is a nice place haven't been travelling much or they just have a really low sense of whats beautiful and nice. For example, how the hell can people say that Alona Beach is so nice? Its a crappy really worthless beach full of boats and seaweed. Only one small spot on one side of the beach where you can be. And the rest of the beaches is not worth visiting at all. You have to take a boat tour to go to other islands from Panglao to reach the beaches you've seen in the pictures. I would not recommend anyone to go to Panglao if they want beach life and just relax and enjoy. This is a MUST VISIT attraction in Bohol. Fine white sand beaches in Bolod and Alona Area. For a safe and reliable rent a car company for your Bohol tour, feel free to reach us. We provide fully air-conditioned cars/vans accompanied by our knowledgeable and courteous tour driver. Call us now for a quotation. I have been to alona beach twice this year,,,and never saw any rubbish dumped. when you go down the hill and onto the beach, turn left and walk past all the cafe's etc and you will not find any rubbish. can I ask you roger just what beach did you go to..as it was NOT alona beach. The most pulluted beach are Bikini Beach. I use to call it Basura Beach. No one can take a bath there. See for your self. Read all 242 comments by readers. your comments on "The Beaches of Bohol"
This article has been viewed 2141 times.